Please mouseover golden words to get additional information. Mexican lacquerware is the name given to the gourds and wooden objects that have been coated for decoration purposes. The lacquering process begins smearing the object with vegetable or insect oil. Next, it is covered with several coats of powdered soils rich in dolostone which are let to dry and polished before being decorated. This technique was called laca (lacquer) or maque by the Spaniards because of its similarity with the Chinese lacquerware. Fragments of lacquered gourds have been found in different archaeological sites around the country. Some of the techniques and decorations are similar to the ones made nowadays. These fragments, together with mentions of lacquerware objects found in Spanish chronicles have helped to establish that lacquer in Mexico comes from pre-Hispanic times. Lacquer was a widely used technique by Mayans, Aztecs and Purepechas, and the objects commonly lacquered were gourds called xicaras. Like most crafts, Mexican lacquerware was enriched after the Spanish conquest: wooden objects like chests, trays and other furniture were soon lacquered with the native techniques. During colonial times, Mexico was part of the Philippines-Spain commercial route hence oriental goods were widely spread around the colony, and this made an impact in the artisans' designs, which were highly influenced by the Chinese art. Different decoration techniques, like the gold outlined and the painting were introduced by the Spaniards, while the carving or rayado and the lacquer inlaid known as embutido have pre-Hispanic origins. There are three states in Mexico where lacquerware is made: Guerrero, Michoacan and Chiapas. Each of these regions share a common base but use different materials and have unique decorating techniques and styles. There are two towns in Guerrero State that have preserved their lacquerware traditions: Olinala and Temalacatzingo. 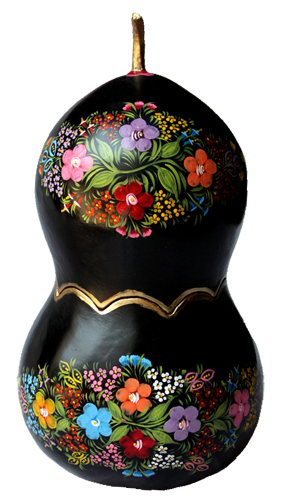 The lacquer in Guerrero is made with chia oil and the techniques used to decorate are the carving technique, also called vaciado, where two coats of contrasting colors are applied and the top coat is scratched away; and the painting technique in which designs are simply painted over the piece. 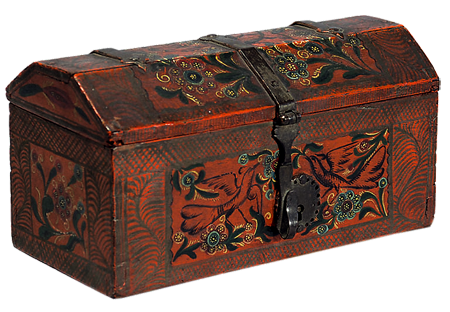 Chests, gourds and furniture are lacquer and decorated with the carving technique or delicately painted. Decorations include flowers, leaves, people, birds, and other animals. Francisco Coronel is among the best known artists from Olinala and is considered a rescuer of old techniques as he brought back the use of gold and silver in the town's lacquered pieces. On the other hand Bernardo Rosendo has mastered the carving technique to go beyond the handicrafts and became a portrait painter. 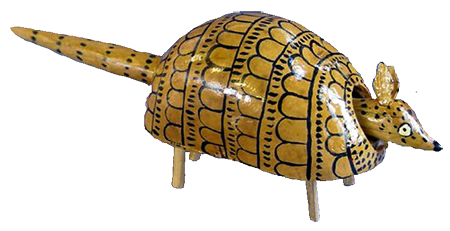 A small Nahuatl speaking village its crafters specialize in lacquered toys, particularly known are the turtles and armadillos with their heads sticking out and gracefully moving, the other trademark objects are gourds painted with delicate flowers. Olinala and Temalacatzingo are not far apart and their artisans use chia oil and local soils to prepare the lacquer mixture but in Temalacatzingo they only use the painting technique and no wooden objects are lacquered. In Michoacan the wooden objects or gourds are smeared with the axe insect oil which is made by boiling, grounding, filtering, and finally drying the insect to extract its fat. In Uruapan the lacquered objects are decorated with the inlaid technique in which a design is first laid down. Next, parts of the pattern are cut out and the hollows filled in with another color. The most common decorations are flowers and animals. In Patzcuaro the painting technique is enhanced with gold outlined. 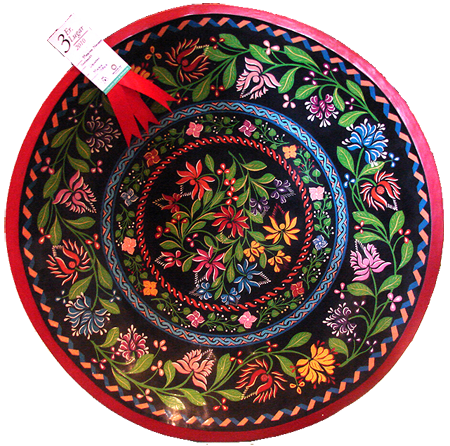 Wooden trays, plates, boxes and gourds are lacquered several times and later inlaid with flowers and animals. Martina Navarro Gonzalez is one of the few crafters in Uruapan that continue making the maque pieces with the pre-Hispanic techniques and is internationally known for her beautiful artwork. Although Patzcuaro was a laquerware center during the 18th Century, today its artisans are better known for their gold outlined painting on lacquered trays, gourds and boxes. Martin Andrade Rodriguez pioneered the rescue of this technique and promoted Mexican lacquerware around the world. He won the national folk art award in 1988 for his dedication and talent. Chiapa de Corzo is the only place in Chiapas where lacquereware is made. The technique used to make the lacquer is the same as the one used in Michoacan but the decoration is done with the painting technique. 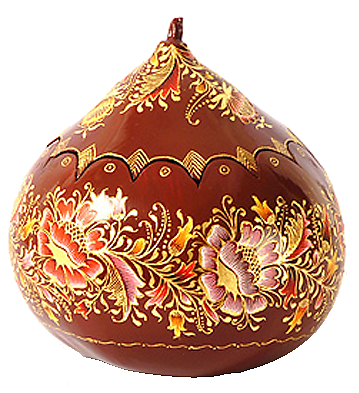 Wooden objects like boxes and crosses or natural gourds are lacquered and later decorated with oil paintings applied with the artisan's little finger. The motives are different color flower garlands. Usually the artisans are women and while in the past most of the town used to make maque nowadays they make it only at the Barrio San Jacinto. Chiapa de Corzo houses the only lacquerware museum in Mexico. For questions or more information please click here. Please click on a button below to view site author's profile. 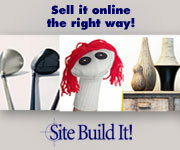 Under no circumstance will we EVER sell or rent your email address. This website looks and works better with Mozilla Firefox browser. 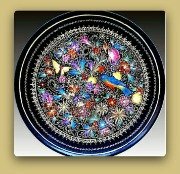 © Copyright 2010-2018 mexican-folk-art-guide.com. All rights reserved.